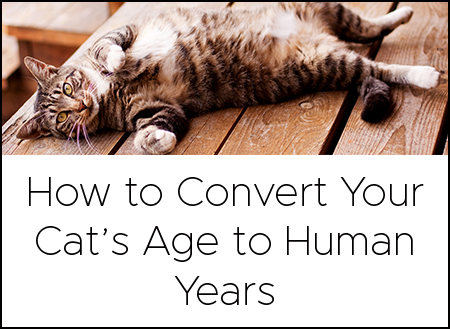 Felines are known to do some peculiar things, but when they do something out of character—like hanging out or sleeping in the litter box—it’s time to figure out the problem and supply a solution. If your cat is spending a lot time in the litter box, take note of what they are doing in there. 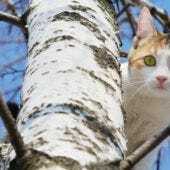 Is your cat using the litter box, then lingering? Or not using the litter box, but hanging out and resting—or is he on high alert? The context of your cat’s odd litter box behavior will help you find a solution. 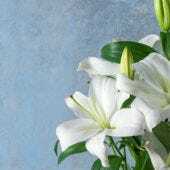 The first thing to do is to rule out illness. If your cat is sleeping in the litter box, pay attention to other routine behaviors: is he not getting up to eat, acting lethargic, or ignoring his favorite view out the window? 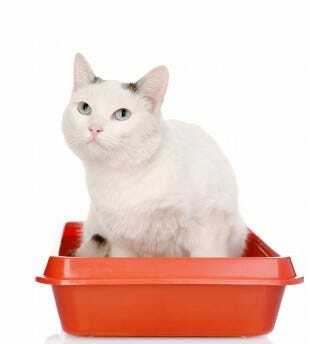 Is your cat using the litter box, but straining or going frequently? Any of these symptoms could mean your can isn’t feeling well and he’s using the litter box as a source of comfort (even if it’s just to keep the toilet nearby). Make an appointment to see the vet and have your cat checked out. Report the abnormal behavior and mention any context clues to help pin down the diagnosis. 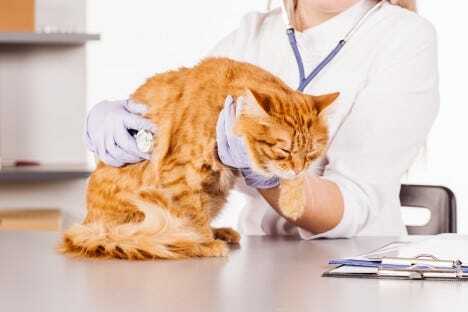 If your cat is female and not spayed, have the vet check if she is pregnant—especially if she ventures outdoors. Or, if you know your cat is pregnant and see her spending long periods of time sleeping in the litter box, she might be looking for a place to have her…well, litter. Feline mothers-to-be seek protected places away from household noise and traffic to birth their kittens, and the litter box easily fits the bill. However, the litter box is not an ideal place to birth or have infant kittens, and it can lead to illness. It’s best to prepare an alternative nesting box for your cat by lining a bin or cardboard box with clean, soft towels or blankets. Place it near the litter box and, once she has resettled in her new, clean birthing box, make sure to keep food, water, and the litter box nearby. 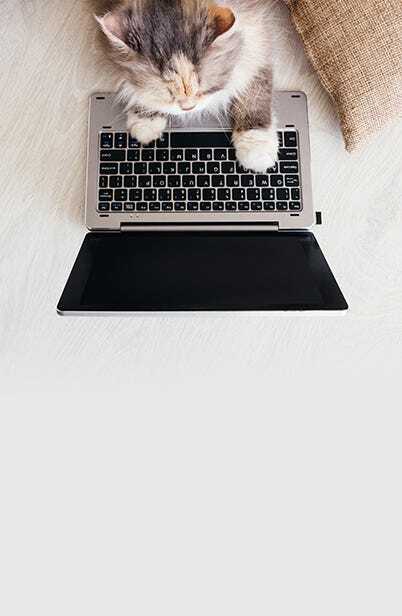 During periods of transition, like adding a new pet to the family, having a house guest, undergoing a home remodel, or some similar upheaval, your cat might have a hard time chilling out. Really, any change in the environment can cause anxiety—anxiety that your cat will try to soothe by retreating to a comfortable, protected spot, and that can include the litter box. In addition to being located away from household noise and traffic, the litter box smells familiar. While the thought might seem off-putting to you or me, for cats, it hearkens to their natural, wild ways. When nowhere else feels like home, the litter box will. The solution: be mindful of tumult in and around your cat’s usual spots and offer a secluded, cozy, clean spot or two in quiet areas. If anxiety is the source of the problem, it won’t be long before Kitty finds these new serene hideouts. When the house is chaotic, guests are over, and the kids are bouncing off the walls, where’s the one place you can go with guaranteed privacy? That’s right, the bathroom. And the same goes for your cat! 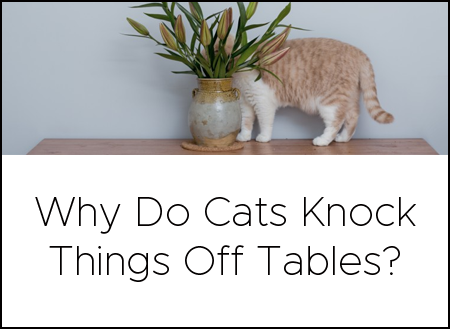 When caught off guard—maybe the dog is being a ball of energy (and so are the kids), or a thunderstorm rages outside—you might find that your cat has crawled under your bed, deep into the linen closet, or, she might be sleeping in the litter box. The litter box is usually in some out-of-the-way room or area and is something that is theirs and only theirs; a place where they can do some serious napping when no other option exists. That doesn’t mean you should let your cat sleep in the litter box, however. The litter box is not a sanitary place, of course, so you’ll want to supply a clean, comfortable alternative and place it next to the litter box. Don’t try too hard to get your cat to leave the litter box; simply offer the clean alternative and let Kitty do as she will. It’s likely that if refuge was what your cat was seeking in the litter box, she will surely find it in the soft clean box you placed in the same location. In multi-cat households, staking out the litter box can be an attempt to claim and defend territory. Depending on your cats’ dynamics, the cat sleeping in the litter box may be guarding it so he doesn’t get denied access by a bully cat, or he may be the one doing the real bullying and keeping other cats away from its litter box. Whatever the case, the solution is the same. To keep the peace and get your cat out of the litter box, you’ll need to add litter boxes in different locations. A good rule of thumb is to have 1.5 litter boxes per cat. So, in a house with three cats, you should have 4-5 litter boxes available. The key is to make them equally desirable and that means keeping them clean. 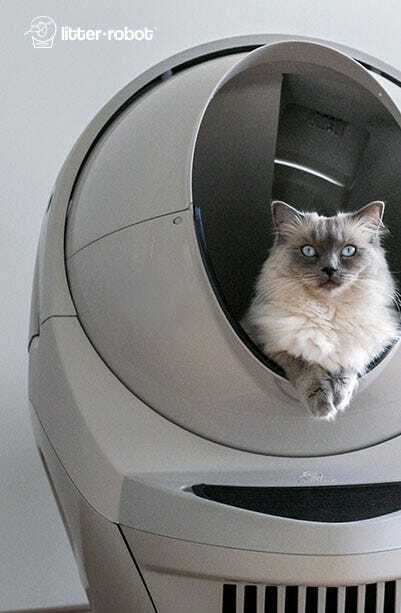 If that sounds like a lot of work, consider an automatic litter box that self-cleans after each use. That way, each cat has a clean bed of litter every time they go and you’re not scooping all day long!